Intel’s third generation Core integrated processor graphics (IPG) chip, aka Ivy Bridge (IVB), got off to a slow start for us with a set of high-end CPUs not really intended for the home theater PC (HTPC). 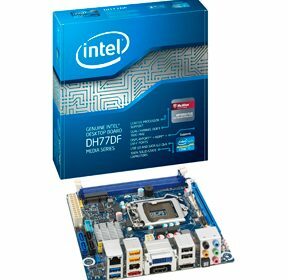 We still do not have one of the low power Core i3/i5 with HD4000 graphics on hand; now that they are available, H77 based Mini ITX motherboards are much more interesting since the updated platform controller hub (PCH) is required to fully utilize new features like PCIe 3.0 and DDR3-1600. There are several options to choose from, but none include the HTPC specific features like Windows Media Center infrared and HDMI CEC support via specialized headers and third-party hardware like the Intel Media Series DH77DF paired today with 65W Intel Core i7-3770S and i5-2400S IPGs. Not content to differentiate only on those features, it also offers mSATA via a Mini PCIe slot and Firewire (IEEE1394a) and addresses a traditional shortcoming in Intel’s previous Mini ITX boards – support for 95W TDP CPUs. Traditionally Mini ITX boards define compromise, requiring a significant loss in expandability in trade for the form factor advantage. While this trade-off is not completely gone with Intel’s DH77DF, it is lessened by the inclusion of Firewire, USB 3.0, and a Full/Half Mini PCIe slot which also provides support for mSATA SSD. Like other Intel Media Series motherboards, the Consumer Infrared (CIR) header is included, which with the right adapter, acts as a fully compatible Windows Media Center (RC-6) receiver supporting discrete on/off and also capable of waking the PC from S5 (soft-off). Somewhat uncommon, however, is the inclusion of the HTPC_HEADER introduced with the DH61AG, which provides a simple way to report recording status as well as HDMI CEC using an adapter like the one from Pulse-Eight. Unfortunately, the BIOS does not currently implement support for the recording indicator, something aggravated by the fact that other system boards from Intel which lack this hardware do have the necessary WMI class available, so it was not possible to test it. Although, the CEC portion works well when paired with the Pulse-Eight Internal HDMI CEC Adapter, so this oversight was easy enough to overlook. Intel recently released a version of their Visual BIOS for the DH77DF which makes it easier on the eyes and to configure settings. I especially appreciate that most defaults are optimal, as well as the placement of many commonly changed settings on the first page, which removes the need to drill deeper for many. Of course HTPC users will still need to click through to change the default LED behavior during S3 (standby) to “Off”, as well as enabling the CIR feature. Oddly, the setting that controls graphics processing unit (GPU) RAM allocation went missing in this release, but since the “right” value (512MB) is configured I have no complaints. Like the DZ77GA-70K, memory timings and voltages were best left alone, even when using XMP compatible modules. Like all Intel Core platforms since the Clarkdale release, the H77 PCH supports HD audio bit streaming, multi-channel PCM output and hardware accelerated decode for MPEG2, VC-1, and AVC (H.264) when paired with a LGA1155 IPG. If opting for a lower power CPU, I would have no trouble recommending the Wesena ITX5 used in this build because, as was noted in our previous review, it was able to handle the 65W Core i5-2400S’s thermal load, but the same cannot be said of the “65W” Core i7-3770S which could not be cooled adequately in the enclosure when subjected to extreme duress. Otherwise, both IPGs performed well in the DH77DF, with the only other issue noted with the placement of the CPU heat sink and fan (HSF) header – where it was impossible to install my preferred low profile LGA115 HSF because Intel clearly designed around their round, retail offering. With plenty of network and USB multi-tuner devices available it would also be quite comfortable to use this system in a server role as well; especially as the mSATA slot (for the OS) makes it possible to add up to four additional internal storage drives. During compatibility testing an issue where the G.SKILL Ripjaws DDR3-1600 RAM was set to DDR3-1333 by the BIOS was discovered (the other DDR3-1600 was properly detected), and attempts to otherwise define it were not successful – leading to POST failures. Fortunately the DH77DF has a failsafe feature where it can easily recover by reverting to the last-known-good configuration, so while it was disturbing that the DIMMs were not properly utilized, no lasting harm was caused. Most of the other components tested functioned as expected, but this is slim comfort for anyone with an AverMedia DUET, which like the DZ77GA-70K, went completely unnoticed by the system. Where issues like this are always noteworthy, and a source of frustration, it is somewhat forgivable at launch – the same cannot be said six months later. BIOS version 102 resolved the issue with the DUET not being recognized. A couple of display drivers have been released since IVB arrived, so it was disappointing to discover that the same issue with levels being clipped around 18 (which is only OK at less than 16 or greater than 235) persists; fortunately the same fix is available in the “Color Enhancement” section of the GPU configuration utility, which also makes it possible to pass blacker-than-black (BTB) and whiter-than-white (WTW) downstream. Oddly, it appears that instead of fixing the issues noted previously with “Quantization”, the option just went missing. Otherwise levels output is what we have come to expect from Intel, good for limited range video (16-235) output but with automatic/unavoidable compression for PC (0-255) content. In most home theater scenarios this will not be an issue, but it does create some confusion when using a video renderer like madVR where “PC levels (0-255)” should be selected in the settings instead of the more intuitive option, as well as being sub-optimal for those who want more PC out of their HTPC. Hopefully the ability to enable RGB-Full reappears (and works properly) in a future driver release; even when unused, the loss of flexibility is always somewhat disappointing. 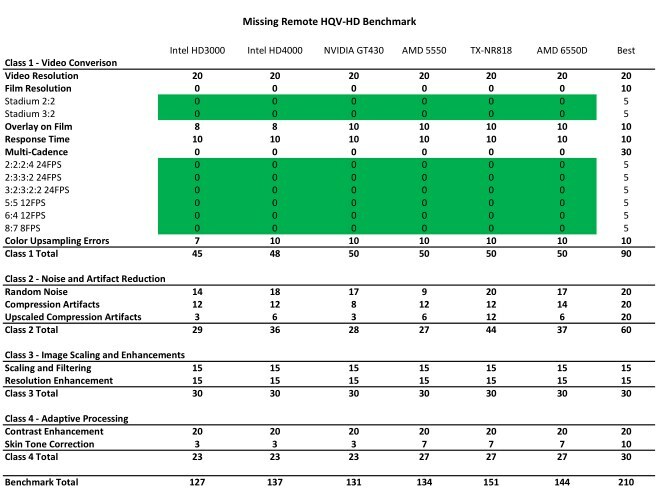 HQV-HD is an interesting benchmark because it provides a decent way to measure different video processors against each other, but like all subjective, artificial metrics it should only be evaluated in the relevant context. 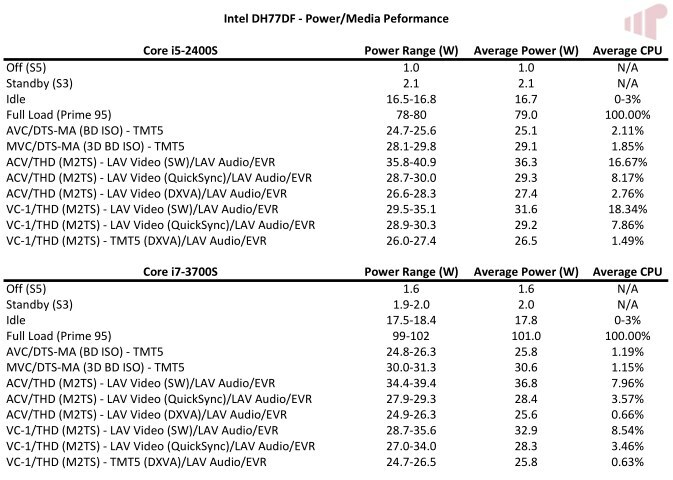 With that said, there are two interesting findings in the results above: first is the thirteen point gain (mostly in noise reduction) from launch noted for the HD4000; and second, how it compares to the TX-NR818 with contains HQV video processing hardware. This second point is especially interesting because it highlights a likely flaw in the cadence detection clips used in the test, where processors that properly detect the cadence (marked in green) cannot score above zero because of inherent moiré (what is scored) in the sample itself. Those holding out hope that BIOS maturity would remove the completive gap enjoyed by other GPU vendors when it comes to refresh rate accuracy will not see relief with the DH77DF. Both the Core i5-2400S and Core i7-3770S displayed numbers mostly consistent with the previous platform (H67) and what was noted with IVB. Values are slightly off where they should be, most notably for “24p” or 23.976FPS content where the 23.973Hz was the norm. Unlike the previous generation of Intel Core IPGs, Sandy Bridge (SNB), IVB GPUs exhibit an issue with some types of PAL television content when the Microsoft DTV-DVD Video Decoder is used. Unfortunately, as this is the decoder utilized by Windows Media Center it is hard to recommend the system to European users reliant on that DVR platform. The issue is limited to this decoder, however, as it is not reproducible with other DXVA2 or Media SDK based filters, and so it is not a general problem with the platform. This issue has been escalated to the driver team and hopefully a fix will be available at some point. This section will be updated when/if that occurs. Issues around video playback are not isolated to PAL, with the DH77DF locking up as it transitions out of 3D mode when Blu-ray playback is stopped leading to condition where the HTPC needs to be forcibly rebooted to return to a workable state. Like the previous issue, this has also been escalated. Hopefully, given the severity, it will be addressed in a timely way. The issues with 3D are no longer reproducible with the latest BIOS update. It was not a documented fix however so it will continued to be monitored. The most interesting artifact noted when comparing two generations of “65W” TDP IPGs in the same system is how relative the metric is in practice. With the Core i7-3770S’s electricity demands found to be more consistent with “95W” Core i7-3770K than the Core i5-2400S. These results are not surprising given the cooling issues observed previously in the Wesena ITX5, so it should be clear that this number cannot be applied statically during component selection. That is not to say that the CPU does not have a clear advantage in area like raw performance, just that TDP cannot trump common sense. Given the previous results the numbers captured during Handbrake testing should come as no surprise – with the Core i7-3770S performing and consuming like a slightly detuned Core i7-3770K. While the power numbers are somewhat disappointing for a “65W” IPG, it is still interesting to note the generational gains in both electrical draw and speed compared against the SNB based Core i5-2500K and Core i7-2600. Historically selecting an Intel Media Series motherboard for your HTPC build was an easy decision. They offer features and capabilities specifically targeted at our needs, including support for internal remotes via the CIR header as well as the recently introduced HTPC_HEADER which offers access to HDMI CEC, alongside unmatched stability. Unfortunately the DH77DF deviates from this trend somewhat and requires a much more nuanced approach than I would like when it comes to compatibility and stability. Obviously the severity of the issues noted will depend on your existing hardware, locale/DVR preference, and attitude toward 3D, but it should not. Now that we have a wide variety of IVBs to choose from the “65W” Core i7-3770S probably will not make it onto many HTPC buyer’s component lists, but for those looking for a fast CPU with HD4000 graphics and a little more thermal headroom than the Core i7-3770K it is hard to argue with the performance offered by the IPG. I rebuilt my htpc with this board and an i3 2120t a few months back, and what a mess it has been. Blue screens every day or two. Video crashing almost like clockwork everytime I tried to play any h.264 video. Half the time windows would recover, the other half it would just hang forever. Spent 3 or 4 hours on the phone with intel support, who was of little help. They kept telling me I’m building a system and it’s my responsibility to troubleshoot and tell them what’s wrong. They replaced the processor, same issues. Well I started digging some more, and found that the bios was over volting my ram from 1.5v to 1.73v, regardless of the bios being set to 1.5v. I finally found the solution on Intels forums where there was 4 pages spanning 2 months of complaints and not one response from intel. Well the trick was to restore defaults in the bios, save changes, and turn off the computer before it finished the next POST. Everything was good after that. Then the new bios update came out that was supposed to fix this issue (the pretty GUI bios), but I just ended up back in the same unstable rut. You now get different ram voltage depending on if you use the classic view or the new GUI, both of which were wrong in my case. Manually setting it again did not seem to change this. I ended up reverting back, and have been stable on the unstable bios for a month or two now, but man, what a nightmare. I wish I had just saved a little money and gone with the p67, since I really didn’t need the h77 anyways. You say that IVB GPUs have an issue with PAL television content. So is the problem not only limited to this motherboard but rather the whole IVB product family? And how about the other issue with 3D Blu-rays is that also a common problem for the IVB family or just the DH77DF motherboard? The issue with PAL content applies across all IVB GPUs. The issue with 3D content only applies to the DH77DF (it worked fine with the DZ77GA-70K). Not sure if this is the same PAL content issue though but i think so. Yes. The issue no longer reproduces w/ *.2932. Great review, and mirrors my own experiences with this board. I did have to lfash BIOS to get it reliable. The out of the box experience was abysmal with BSODs all over the place. The situation with levels is unfortunate but I think most casual users, when connected to a consumer TV-Levels calibrated display, will not notice. Photos and videos will look “right” and they’ll be happy. Anyone know if the REC light has been supported in BIOS yet for this board?